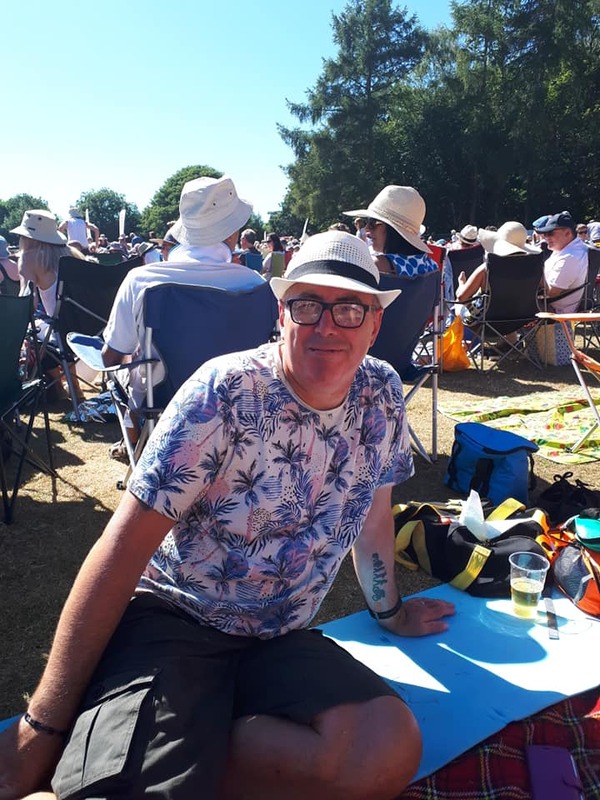 This isn’t a new place for me as I visit The Harvester in Boldmere most weeks after a Saturday morning bike ride for breakfast. 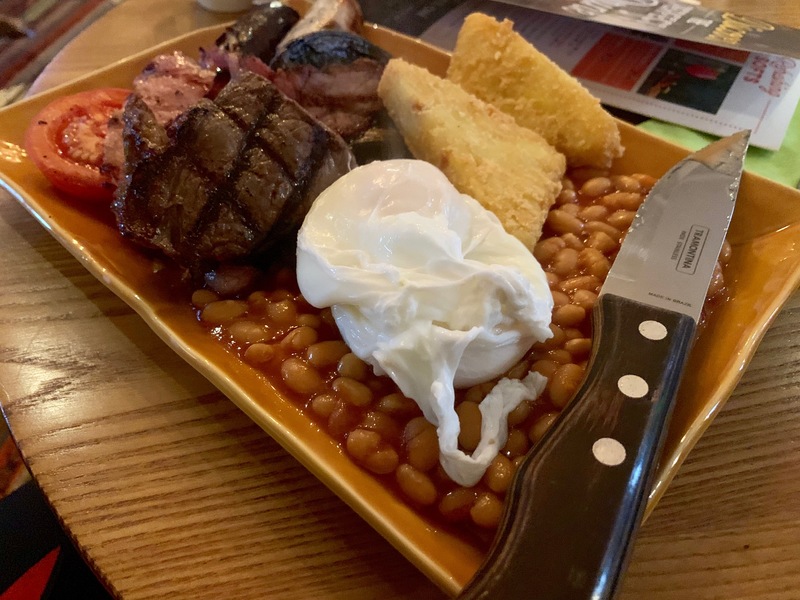 I do however like to vary my post-ride nourishment and when Mr Birmingham Breakfast club himself joined me it was decided that my breakfast was worthy of the review instead of his bacon and egg sarnie. 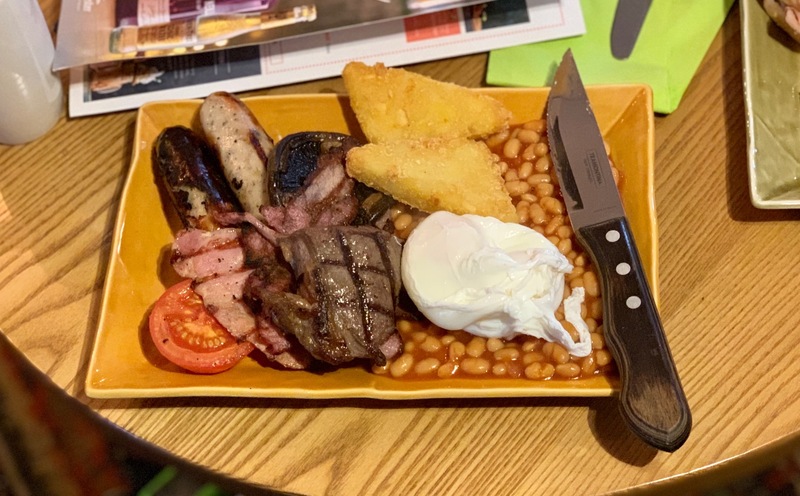 Not that his bacon sarnie wasn’t good, but my breakfast was a Full English with steak – and it impressed him, (even if the beans were not in a ramekin to his liking). Bacon – Not the best bacon but the 3 slices was still good quality so by no means the worst and was griddled to perfection. Sausage – Two good quality slightly herby and cooked to perfection for me with a slight bit of chargrilling. Tomatoes – One fresh half and not to my preference but still good. Beans – My one major let down was they was luke warm, but still edible as the rest was piping hot. Mushroom – It’s plural for that reason as it was one large mushroom but was cooked to my liking. Eggs – I had choice of eggs. I had two well poached eggs with runny yolks. Hash Browns – Two non-greasy which was a bonus. The plus factor was the added 4oz rump steak which is an extra, cooked to my liking which is medium rare; perfectly. The minus was there wasn’t any toast… But did I have room for any – I’m not sure! My breakfast and the bacon sarnie for Mr Birmingham Breakfast club for under £12 is well worth it and even though I’m a fan of independent cafes some of the chains also do a decent breakfast occasionally so it’s nearly worth considering them.